The Environmental Science Co-major emphasizes earth science and life science approaches to understanding environmental patterns and processes. Students are prepared to pursue a wide variety of career paths and post-graduate degrees in environmental science, especially those with biological and physical science specializations. The Environmental Science Co-major complements the primary major, which provides significant depth and breadth in an academic discipline. 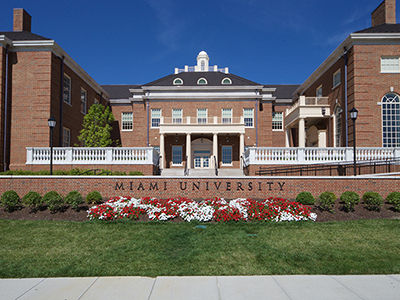 (For students who began before Fall 2015, please see the relevant Miami Bulletin, General Edition.) The Environmental Science Co-major requires 33-39 semester hours, distributed as listed below. Depending on your major, some of these credits may also count toward your primary major. For example, some majors could meet the Environmental Science Co-major requirements by taking 18-24 semester outside of their major. Note: PHY 161/162 or 191/192 is strongly recommended. *This must be approved by the IES Director or the Co-Major Advisor.